Moore returns to direct the film along with Johnston, who co-wrote, the original. In the sequel, Ralph and Vanellope go to the Internet to find a replacement part for Vanellope’s Sugar Rush game. However, time is of the essence because if they do not retrieve that piece in time, everyone in Sugar Rush will be forced out of their homes. 1- An idea for a story something personal in their own lives, observations, almost anywhere. So it is up to the story team to help visualize Rich and Phil’s story. Together with the directors, writers, and producer, the story team characters, theme, dialogue, and entertainment. From there it goes to script. 2 – Jason Hand (story artist) says the script is then divided amongst the various story artists who help shape and add the gags, hilarity, and entertainment. These boards will also help block a scene and figure out where the camera should be focusing on during a particular scene. 3 – Much of the artists will provide their own sound effects and voices to give a sense of where the scene is going or how it can be improved. Often times directors are also collaborating and giving feedback with their fellow story artists. There are even times where they add to a scene to make it better. This is called plussing. 4 – So after they take a pass at it with the first screening, where many of the involved artists are, they take it to the story trust, which is a group of Disney directors, writers, and heads of story, who will give notes, and have more plus suggestions. The goal is to find the best idea. 5 – Since Ralph Breaks the Internet was going to take place on the Internet, the story team tried a variety of ideas using Internet tropes like a meme factory, where Netizens (citizens of the Internet) would create memes simply by typing random words. However, a lot of the jokes were at Ralph’s expense, and the idea was scrapped because instead of being really funny, it felt really mean. 6 – While there are many tropes that the Internet is known for, like cat videos, reaction videos, memes, and GIFs, the idea was to go with something that felt familiar. Natalie Nourigat (story artist) says they took a blue sky approach when it came to satirizing the Internet. So they concentrated on satirized entire genres so that it would have a bit more longevity. 7 – Josie Trinidad (head of story) describes the collaborative process as an organic script that is constantly being updated and when it’s given to the artist and each individual artists will add ideas and gags, and when we pitch it, more ideas and gags. So the script is constantly changing. Sometimes they do take a step backward, but it is constantly evolving, even when the voice cast comes in to record the dialogue. 8 – There can be up to eight to nine screenings before everyone agrees that the film is the best possible film they can give. 9 – The team took a research trip to One Wilshire in Downtown LA, a massive building that is home to one of the largest connections for any Internet communication in North America. 150 storyboards, so over 100 ideas were thrown out. 7883 sequence versions, so every kind of iteration each artist does to make some changes. 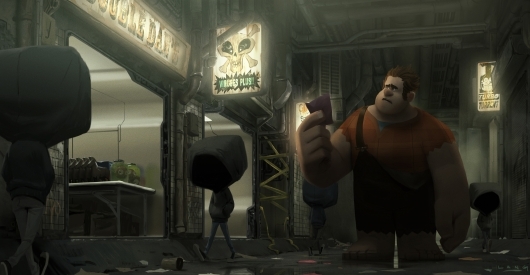 12 – While each building is a website when you go in the physical space is not the same because it’s abstract like the arcade games in Wreck-It Ralph. 13 – Transportation for the avatars or Net Users (people using the Internet represented as avatars) are self-driving cars, so when you click on a link, the car will form around them and send them to the website destination. Netizens are the ones who can move around freely using an Amazone drone or email. Meanwhile the traffic signals are the close, minimize, and maximize buttons at the top of a window. 14 – There are different levels of the World Wide Web. There is the surface web, then there is the deep web, a portion of the Internet which cannot be accessed by your search bar or browser. It’s archives and encrypted material. That is located underneath the surface web. Finally, there is a third portion, where the outdated and discarded portions of the web accumulate. Some examples include the dial-up express and Napster. It’s here that all of the users who access this point are incognito. 15 – Larry Wu, head of environment, says the film will have a combination of real and fictitious websites. Fake websites like Buzzztube, a digital media website, looks like a volcano, and the more likes you give it, the higher it goes up. Real websites will resemble their namesake. Twitter will be a large tree with birds tweeting; Amazon’s building structure looks like a bunch of cardboard boxes stacked on top of each other; YouTube will be a large TV screen; Facebook is a giant book with an F on it. Snapchat is a bunch of revolving screens. 16 – The outside of Oh My Disney Site will resemble Disneyland with motels and hotels surrounding the site which mirrors the real-life Disneyland in Anaheim, CA. 17 – The Disney Princess dressing room scene was inspired by the Disney Dream Suite. A hidden area contest winners are able to sleep inside of the park. In the Disney Princess dressing room scene, every cubby will have some sort of Easter egg that represents each princess. Snow White has the magic mirror, Rapunzel has a painting of the mural. Ariel has thingamabobs. 18 – Ernie Petti, technical supervisor, says the team had to create more than 150 unique master sets, which are the unique environments that the characters travel to at some point in time. 19 – Assets from previous films like Tangled, Zootopia, and Bolt are used in Ralph Breaks the Internet. For example, you might see the frying pan from Tangled appear in the Princess dressing room scene. However, it is not as simple as pulling it from the archives. The textures and look of an asset from a previous film may not age as well as some of the more current films. 20 – Some shots may have over 100,000 shot elements to populate out, and that is not including crowds themselves, the crowds and characters, and the crowds and vehicles that are in the scene, which may be over a million elements. 21 – In creating the Internet, the idea was that the world was built over time. So, in the beginning, there might have been Netscapes, AltaVista, and Napster, but it has been built over throughout the years, with new sites like Google, Facebook, and Twitter, and as their popularity grew, the challenge was to figure out how to populate that world. Which was not like any other as not only would there be Netizens and net user foot traffic from below, but Netizens and net user traffic from above. 22 – Netizens are programs that help out at various websites and apps. Say you are on Yelp, and you are looking for tacos, a Netizen will then be the program to bring suggestions to you in an instant. They are basically the ghosts in the machine who are running all of the actions you would do when you are clicking on a web page. 23 – Net Users are the Internet versions of you and me, the person who requested for tacos. While they may have a regular body, their heads look like the apps you may see on a phone, where the corners to a square are more rounded. 24 – As for the number of characters we will see, there will be a lot. Using previous films for comparison, Bolt only had 57 characters. Ralph Breaks the Internet will have 434 characters, including 6,752 variants. A variant is where they take a character and change the clothing, change the faces, and change the hairstyles, and then it becomes something else they can use later on. A perfect example of this is in Zootopia, where Judy’s siblings were all given different clothings or the guard dogs where they were given different shades of fur. 25 – Simply adding eye blinks and head turns brings the world to life. 26 – Yesss (Taraji P. Henson) is the described as the curator of cool, and in order to keep up with the constantly changing trends she is constantly changing her outfits and her hairstyle. In fact, she changes them just as fast as the new trendy content on her site. 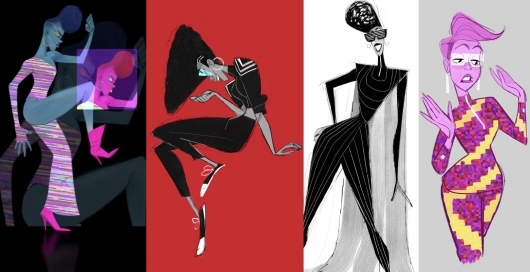 27 – But her most recognizable design will be similar to that of another Disney fashionista. The coat that Yesss wears will be similar to Cruella De Vil’s fur coat. Though it is not made out of the same material, for obvious reasons. Instead, everything about what she wears will be made up of digital pieces like fiber optics. 28 – A lot of the characters’ movements and gestures are inspired by the talent’s recordings. Animators are also in the room taking notes and drawing the actors facial expressions and personality, so that it can serve as inspiration for the character design. 29 – Knowsmore will not be like either the net users or Netizens. He’s a relic of the internet. Think of an outdated search engine like Altavista or AskJeeves, but with a Truman Capote and Droopy Dog voice. 30 – While there were different character designs ranging from a light bulb to a little professor, ultimately they decided to use the logo for the Knowsmore search engine. Of the many characters in Ralph Breaks the Internet, Knowsmore is the one character with the most hand-drawn aspects to it. The hand-drawn eyes would give artists the freedom to do anything for any shot at any point in time. 31 – The idea for a self-deprecating Disney Princess dressing scene was conceptualized in early discussions with Ralph Breaks the Internet co-writer Pamela Ribon in 2016 when she was working on Moana. 32 – They knew that they wanted to be meta in Ralph Breaks the Internet, so they came up with an idea that Vanellope would be hiding in the Princess dressing room within Oh My Disney, and not understanding what it means to be a princess according to the Disney criteria: poisoned, kidnapped and/or enslaved, talk to animals, have magic hands, etc. 33 – They were worried that the first draft wouldn’t make it past the first initial screening, because they were poking fun at Disney princesses. However, it worked out so well that it was kept all the way to the end, which is virtually unheard of in comedy. 34 – Oh My Disney is a website that is basically everything everyone loves about Disney under one room. In the film, it will look like something straight out of D23 and Comic-Con. 35 – Ami Thompson (art director), and her team saw that all of the 2D princesses were designed differently. So to make it look like there was uniformity, the team based their designs on Oh My Disney version of the Disney princesses. 36 – Other forms of research had the team traveling to Disney land to meet the princesses so that they can document and draw their personality, mannerisms, and gestures. 37 – When the princesses change into comfortable clothes, each one of them will be wearing something that is akin to their film. Snow White will have a shirt with a poison apple on it; Sleeping Beauty will wear a shirt that reads “Nap Queen”; Mulan will wear a bomber jacket with a Mushu embroidered on the back. 38 – There will be recognizable poses, foibles, and iconic moments from each Disney princess. All of it will be a humorous homage to the character. While some of them may not be as obvious, the idea is to tap into something that is familiar. 39 – Kira Lehtomaki (head of animation), says the team also had help from Mark Henn, the legendary Disney animator and supervising animator for Ariel, Jasmine, Belle, Mulan, and Tiana. He also worked on Frozen where he helped with Anna and Elsa. 40 – The living original voices of the Disney princesses will be back to reprise their respective roles in Ralph Breaks the Internet. Pamela Ribon will voice Snow White. 41 – Moore and Johnston invited Brian Curless, one of the world’s most renowned auctioneers to inspire some of the film’s auctioning scenes. He is the reigning US champion auctioneer. 42 – Fix-It Felix and Sergeant Calhoun will also be in Ralph Breaks the Internet. They will be acting as surrogate parents to the orphan Sugar Rush Game characters who fear they will be without a game. 43 – Not every Disney princess is in the film. The team decided to use the canonized group of Disney princesses in the dressing room scene. 44 – Marvel characters are well presented in this film. Some of the Net Users will be cosplaying as Marvel characters. 45 – Moore and Johnston realize the film may miss out on some Internet trends, but that’s because most if not all of them are short-lived and fleeting. So it was easier to concentrate on pillars of the Internet like social media, shopping, and entertainment. 46 – Ralph Breaks the Internet picks things up right where we left off. Ralph is wrecking the building in his game and Vanellope is racing her cart in her game and when the games close, these two spend time together outside of their games. But their lives are interrupted when Mr. Litwak installs a WiFi router. This strange new place is quickly deemed off-limits and no one is allowed to enter it. So everyone heads back to their games for a new day at work. 47 – But when a player breaks a controller from Sugar Rush, Mr. Litwak tries to find a replacement part. Unfortunately, the company who made it went out of business. So the customers help find a part on eBay, but it may be out of Mr. Litwak’s price range. So Mr. Litwak thinks that it may be time to unplug Sugar Rush and sell it for parts. 48 – Ralph and Vanellope then decide to go the Internet and find eBay. However, they do not have the slightest idea of how the Internet works and when they head to eBay, they believe that it is a game where the person who wins is the one who shouts the biggest number, not realizing that the numbers come at a huge price. 49 – Unable to come up with a large sum of money, Ralph and Vanellope only have a few days to pay for the item or else they forfeit it. Enter Yesss, who sees that they need help. She suggests that they create viral videos to come up with the money. The more likes they get, the more money they put in their pockets, which puts them that much closer to paying for the item. 50 – Like Zootopia, Ralph Breaks the Internet addresses some very real-world issues that affect us today.